No. 74. The Bliss Jade-and-Pearl Necklace. Dumbarton Oaks Archives. Robert’s Christmas present to me was a jade necklace, with which I expect to turn all my friends into envious enemies. The beads are more beautiful in translucency and subtler in tone than any I have seen, and while in London I think I got to the root of all jade. Both Blisses had a strong attraction to and a fascination with jade. Indeed, the Dumbarton Oaks Museum retains 171 jade or jadeite objects in its collection. Moreover, Robert Bliss is known to have often carried in his pocket a piece of Olmec jade which he routinely caressed with his fingers. 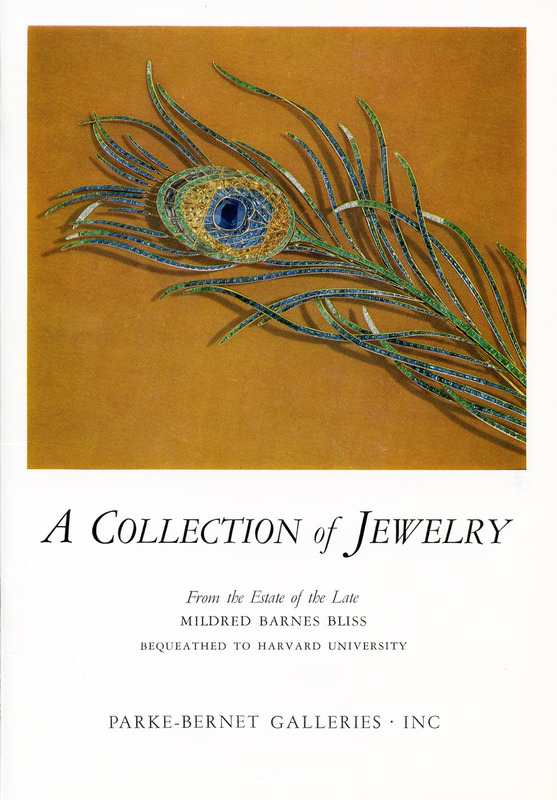 And in Mildred Bliss’s correspondence with jewelry dealers, she always sought jade of the very highest quality, often rejecting jade pieces that were offered to her due to her dislike of their color or the cloudiness of the stones. The name of the game these days is auction and Parke-Bernet’s jewelry sale on Jan. 15 could bring out the cream of the addicts. At that time the fabulous jewel collection of Washington socialite, the late Mrs. Robert Woods Bliss, will go on the block. In the ravishing style of the ‘20s, the collection is made up for the most part of colored stones. Bidding is expected “to the death” for a 9-carat emerald ring, a 24-carat sapphire pendant, a pair of sapphire and diamond brooches and an Imperial jade and pearl necklace. For those who like something a little wilder, there is Mrs. Bliss’ peacock feather brooch in colored stones with a huge sapphire forming the “eye” of the feather and a miniscule key to unlock each multi-jeweled strand from the feather’s stem. Proceeds from the sale go for the upkeep of Dumbarton Oaks, the Blisses’ Washington estate in Georgetown, which they left to Harvard. Prominently illustrated in the auction catalogue is no. 74, a “Magnificent Imperial Jade and Pearl Necklace,” Robert Woods Bliss’s Christmas gift of 1913 (see image above). A copy of the auction catalogue and Mildred Bliss’s correspondence with her stepfather are retained in the Dumbarton Oaks Archives. Auction Catalogue with a Detail of the Peacock Feather Brooch, no. 54. 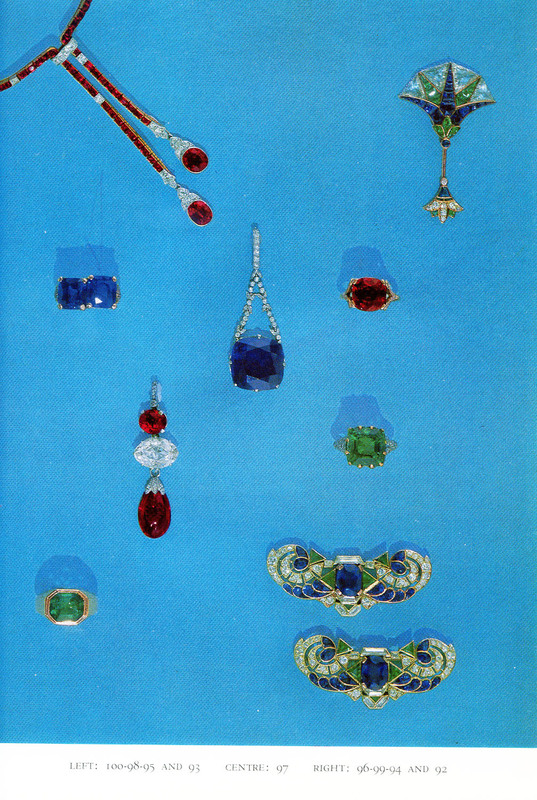 Jewelry, Including the 24.9 carat sapphire and diamond pendant (97, center), the 9 carat emerald and diamond ring (94, right, lower middle), and the diamond and sapphire brooches (92, lower right).